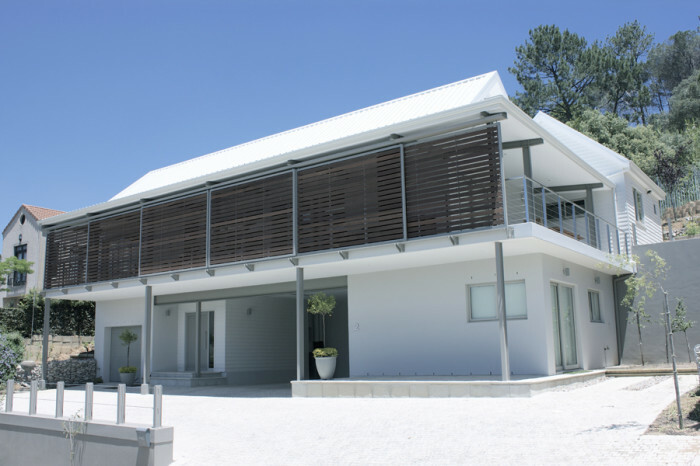 Situated on a steep slope over looking the Paarl valley, House Goosen is a combination of masonry construction, steel portal frames and timber framing. The design draws from typical Cape Coastal architecture, with its dual pitch roofs and the front ‘stoep’ under the ‘afdak’ but using clean lines and minimal styling for a contemporary look. The architectural style departs from the Cape Coastal internally, with the entire living area being in one open plan volume. To achieve structural integrity with timber frame and the large open internal volume steel portal frames were used as the structural system. The contemporary styling is enhanced by leaving the structural elements exposed. 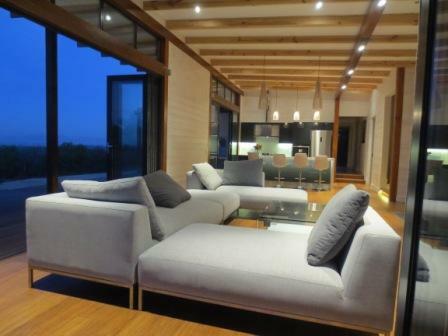 This is our first project designed in accordance with the new SANS 204 Energy Efficiency regulations, and the house features double glazing throughout, with sliding screens to control solar heat gain as well as to provide privacy.